1.Complete the card phase to compile the cards each player will utilize during the round. 2.Complete the actions on each card, using your allotted resources, to receive specific animal tiles and move your marker further up the animal track. 3.Tally your victory points – the player with the most points wins! Explore a forgotten island with your scientists, capture and study (extinct) animal species to gain the most points! The components are just ok, no top quality. You get a colourful island, plastic scientists and a lot of (small) cards. The card holder is original and functional. The rules are clear and easy, a player aid explains the special abilities of the cards. This is a light and quick Feld game. Every turn you decide the use of each card (3 possibilities: special ability, resources, research), play your cards and place a scientist. The setup is variable and you have standard and advanced cards, so every game is different. A lot of actions are taken simultaneously, so the game plays very fluid. A quick and light, somewhat forgotten, Feld game. 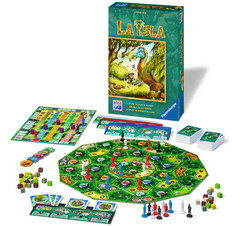 Add a Review for "La Isla"